For our readers outside the DC area: the U.S. capitol was hit by an extremely hard and unexpected storm on June 29th. Trees were uprooted, power lines were downed, and serious flooding occurred. Even on the following Monday, many were living without power and government employees were given the option to work remotely due to federal buildings being without electricity. This may sound unfeeling, but I will go ahead and admit: Friday, June 29th was one of the best in recent music-memory for me. Jukebox the Ghost was playing the 9:30 Club. I was safe, dry, rocking out, and singing along. Just happy to be there. The DC-born band was back for its second time headlining at the 9:30 Club – and it was the biggest headliner show the group has played yet. The trio is obviously a home-town favorite, and the energy in the Club was astounding. People dancing, singing, fist-pumping, and even crying at points (OK, so real talk real time: I was crying. I LOVE this band). Jukebox got on a half hour before its scheduled set-time and played almost a two-hour set. They covered their old favorites (Empire, Hold it In, etc) newer songs (Say When) and the newest off their forthcoming album (my favorites were Don’t Let me Fall Behind and Adulthood off the new album Safe Travels). They also regaled the crowd with their trademark cover: Whitney’s I Want to Dance with Somebody. The show was a typical Jukebox extravaganza: full of good energy, pleasant chatter from front men Ben Thornewill and Tommy Siegel, and top quality drumming from Jesse Kristin. Every time I see them, I am re-affirmed in my belief that they are THE hardest working hipsters out there (they even joked, at the end of their two-hour performance, that they had just hit intermission and everyone should plan on taking the morning Metro home). I wouldn’t have been that surprised if they’d made good on their promise – and I know I’ll be in the crowd for the next marathon jam-session they put on when they return to their adoring hometown. Chicago – What better way to spice up the middle of a blah week than skip your night class and go to a concert? Who needs education anyway right? Wednesday was the eve of my dear friend’s 30th birthday. She has this whole long list of things that she’s not allowed to do after she turns 30 (eat PB&J, play drinking games, take shots for her age, wear glitter makeup, pretty much everything that makes life worth living) so I bought her some Wonderbread, some Smuckers, and some Jif and brought her to the House of Blues for a night out with Jukebox the Ghost and Jack’s Mannequin. We got to the venue about halfway through the opener, Jukebox the Ghost’s, set and the place was already packed. Before I get to the music though I have to give a shout out to the venue – this was my first time in a House of Blues – I’ve always looked down on it because it’s part of a chain. I figured it would be soul-sucking money maker with no character – not true at all! This place actually ranks as one of my favorite concert venues in Chicago now. Decorated with pop top art and weird statues and masks on the walls – I’m usually one to stake out a spot next to the stage and move neither for hell nor high water nor drunken moshers for the subsequent three hours, but I couldn’t help but roam the place during the breaks between sets. The two or three full bars scattered around didn’t hurt either. My sister and I like to call Jukebox the hardest working hipsters on the circuit. These guys just tour relentlessly, and every time I go see them I’m waiting for one of them to just pass out mid-set – I always think I should pack a sandwich from them just in case. They made it through their set with energy to spare though – playing say when, schizophrenia and good day, along with a medley of cover songs. There’s nothing to dislike about Jukebox’s music: it’s upbeat, it’s catchy, it’s imaginative, and everyone who I’ve forced to try it out (which is many) feels an instant connection to what the band’s trying to get across – take a listen, and I promise you won’t regret it. 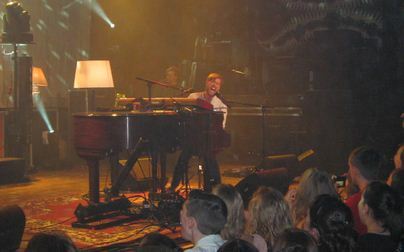 The main act, Jack’s Mannequin, was the second pleasant surprise of the night. I’ve never really given much thought to Jack’s Mannequin – I knew their one song, Dark Blue, and wasn’t really blown away by it, but I was absolutely blown away by their performance. Let’s start with the set up for the stage – a disco ball, Ikea lamps and a baby grand piano. There are too many bands out there who use totally overstimulating and gratuitous props for their sets that just take away from their music, but this set up was perfect: baby grand – classy, Ikea lamps – intriguing, disco ball – fun. Yes, yes and yes. The lead singer of the band, Andrew McMahon, absolutely dominated the stage in his white suit and sweet facial hair (I kept on hearing Ke$ha in my head throughout the night “I like your beard”.) He’s an excellent vocalist and although he didn’t do a lot of dancing (my favorite part of concerts is watching the band rock out) his energy was infectious and he absolutely had the crowd going. While I’m not sure that I’ll be listening to Jack’s Mannequin’s albums nonstop now (I tried them when I got home and somehow they just didn’t quite translate as well as they did live) I certainly enjoyed them in person. Overall an excellent way to spend a Wednesday. Oh Jukebox the Ghost, how many ways does DC love you? Enough to eschew our nerdy early-to-bed weekday habits and actually come out for a Thursday night show? Yes. Yes, JTG, for you we will come out in the hundreds to fill the venue in recognition of your graduation from the Black Cat (an equally awesome but undeniably smaller stage) to your first headlining show at the 9:30 Club on December 1st. Enough to forgive a totally debaucherous first song? Of course. Ben, when you realize your piano isn’t actually plugged in after you run onto stage to the screams of your fans and you have to scramble to re-connect it and then call off the first song altogether because you can’t quite recover… it’s OK. We love it. Especially when that song is a crowd pleaser: “Empire.” No worries guys (and good recovery jokes by the way, your self-depreciating humor is absolutely part of your charm). Enough to overlook technical difficulties? No question – that wasn’t even your fault. Shame on whoever the IT guy (or girl) was for letting your album cover graphic default back to a PC desktop screen on the stage backdrop: an embarrassing but temporary glitch. Otherwise, great stage set up: simple but fun with your one string of white Christmas lights. Loved it. We loved your stories from your European tour, including the image of Jesse playing the drum with baguettes and we loved even more that you were back, not only in the States, but in the District. Come back soon. I’ve seen you four times at this point and I’m looking forward to the fifth.